Samuel Jon Hornish, Jr. (born July 2, 1979) is currently second in the NASCAR Nationwide point stands; just eight points behind points leader, Austin Dillon. Hornish drives the No. 12 Ford Mustang for Penske Racing. 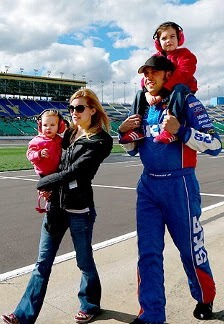 On February 4, 2008, Sam and his wife Crystal welcomed their first child, Addison Faith Hornish, into the world. Sam and Crystal welcomed their second child, Eliza Jo, on December 28, 2010. Labels: Kids of NASCAR, NASCAR Race Mom, NASCAR Sprint Cup Series, Sam Hornish Jr.